Dozens of officers from multiple agencies responded. Coordination of actions becomes key to success, but Patrol must be trained to act immediately. In the early morning hours of Sunday, June 12th, 2016 an American-born, alleged radicalized Muslim terrorist walked into Pulse, a LGBT bar in Orlando, Florida and committed the worst mass murder in the U.S. since the 9/11 attacks. A Orlando Police officer working at Pulse in a uniformed, off-duty security capacity, engaged the suspect with his sidearm shortly after the first shots rang out. However, based upon early reports, it appears the murderer’s rifle fire (and the very crowded venue) was enough to keep the off-duty officer from effectively engaging the threat, bringing on a horrific scene of multiple killings. The Orlando Police Department and Orange County Sheriff’s Department responded quickly, but after dozens of deaths and injuries, the terrorist herded a large group of hostages into the women’s restroom where a nearly three-hour stand-off ensued. We’ll break down the nightmare dynamics of an active shooter event turned barricaded hostage taking dilemma. FBI SWAT Team Active Shooter Hall Boss training (photo by fbi.gov). EDITOR’S NOTE: While the BlueSheepDog Crew recognizes the importance of discussing and learning from these tragic events, we also respect the sanctity of the mourning families. As such, we will not mention names of the victims. We further refuse to aid or assist in promulgating the notoriety of the killers, a goal most of these psychos have, and therefore will only refer to them as terrorists, murderers, or killers. The design of Pulse in Orlando, Florida compounded the difficulty in victims fleeing and officers entering. At this time at least 49 victims were killed in the attack, and over 50 were wounded. Nearly 40 died inside or outside Pulse, while several others died en route or after arriving at local hospitals. Orlando area hospitals have been inundated with patients, and several have required extensive surgeries. Doctors describe most of the victims with upper torso injuries, though some had extremity injuries as well. “Lone Wolf” terrorist attacks have become more common than massive, coordinated terrorist attacks like Beslan, Mumbai, and Paris. Part of the reason is because it is incredibly more difficult to investigative individuals than larger groups. In addition, a “lone wolf” may be docile for much of their life, but suddenly respond to inflammatory rhetoric and make rash decisions to become involved in a terrible atrocity. Pulse only occupies the corner, showing the very confined space 300+ patrons were crowded into. 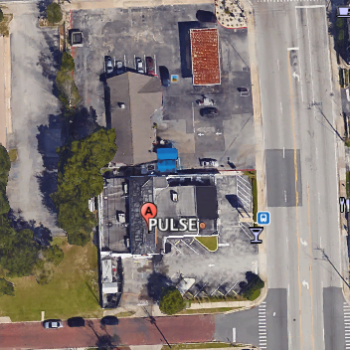 The nightclub Pulse is a well-known LGBT bar in Orlando, and was hosting a “Latin Flavor” event the night of the attack. It is estimated there were still 300+ patrons inside or around the club when the attack began, despite a recent last-call for alcohol. Witnesses stated the initial shots were misidentified as part of the show, and it was not until screams were heard that many realized an attack was in progress. In addition, there are reports the first victims were actually shot and killed in the parking lot, prior to the terrorist entering the bar itself. More information will no doubt paint a clearer picture, but the image that must be emblazoned into the mindset of law enforcement responding to such an event is this – the killer is committed to killing! Though this event settled briefly into a barricaded hostage situation it is apparent by the ending the murderer only desired to inflict more casualties. The Pulse is rather compact and has limited exits. A consistent theme of “lone wolf” attacks has been to target large gatherings of people, with limited points of egress. Adding the low light conditions of a crowded bar only exasperated the surprise and results of this particular attack. Many patrons and employees simply dropped to the floor or tried to hide in place. Others stampeded in all directions. Some escaped, while others found places to hide inside the bar. We’ll talk more about options later in the article. An interesting fact of this attack is the presence of armed security in the form of an off-duty, uniformed police officer. In most cases the terrorists have initially sought soft targets (unarmed civilians) to increase casualty counts. The Boston bombers initially escaped and then killed a MIT police officer before entering into a wild car chase and shoot-out with police. Whether the terrorist failed to conduct adequate surveillance prior to his attack (a mis-calculation), or if he believed his weaponry would be sufficient to suppress the officer, or if his intent was not to leave the bar at all, will likely never be known. What little we know of the terrorist is troubling to say the least, and could result in a call for much tighter scrutiny in the area of intelligence activities for suspected terrorists in the future. The challenge facing law enforcement is how far can we go, and still protect the Constitutional protections of citizens. This is particularly troubling when the killers are naturalized Americans, or legal residents. The Patriot Act has been both effective, and harshly criticized. The Administration had been slow to call previous “lone wolf” attacks terrorism, like the Ft. Hood shooting, the Boston Marathon bombing, and the San Bernardino attack. However, the President has already labelled this an act of terrorism. The nature of the Orlando attack is somewhat clouded by the targeting of a LGBT location (hate crime), but according to the killer’s father and co-workers the terrorist expressed a strong dislike of homosexuals. Was this attack more in line with radical Muslim terrorist organizations, was it one man’s hatred for LGBT persons, or a combination of both? A look at one of the side exits at Pulse. This is not the first time ISIS or other radical Muslim terrorist organizations have targeted homosexuals in their overall agenda of an Islamic caliphate by force. Other targets have included Christians, moderate Muslims, foreigners, and even other Muslim terrorist organizations. However, the messages of this terrorist about ISIS and other terrorist organizations indicate the decision to kill was motivated by radical ideological beliefs. It would appear the terrorist is not as well-connected with the terrorist organizations he claimed allegiance to since two mentioned organizations are at odds with each other. Therefore this act may have been an opportunity for this murderer to be a part of something bigger than himself, and he chose the target for his personal hatreds. Regardless of reasons, the selection was ideally suited for mass killing – large numbers of victims present, confined space, dark, and little security. 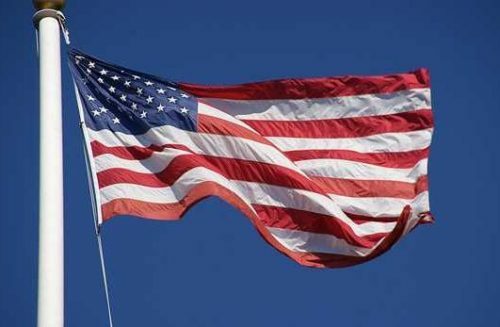 Unfortunately, the latest terrorist attacks on American soil have come from radicalized Americans (photo from freefoto.com). The terrorist used a Sig Sauer MCX rifle, which is unusual for its more expensive cost (photo by Sig Sauer). It would not be insensitive, or inappropriate at all, for law enforcement agencies to put out an advisory to the media and their own websites, detailing the characteristics of mass killers and asking for the public’s help in identifying those exhibiting those same characteristics. Removing religion entirely could still provide a reasonable picture of those bent on destruction. A matrix could be developed to determine if reported suspicious behavior meets the criteria of a contact or not. If the information leads police to believe a suspect may be capable of an attack, the response could be anything from an advisory to officers to surveillance to an immediate knock-and-talk. The BSD Crew are not “Big Brother” fans at all, and this suggestion should definitely have safety guidelines in place to avoid unnecessary intelligence gathering or interfering with law-abiding citizens. It would all be based on received information, turned into intelligence by investigatory revelations. If there is something there, action is taken. If nothing is there, no action is taken. This is just one suggestion to finding the mass killer before they go on their spree killing. EDITOR’S NOTE: As I was completing this article I learned the Disney World’s denial of current and retired law enforcement carrying firearms concealed at their amusement park. The arguments for allowing officers to carry involved just such an opportunity by a committed terrorist for a mass killing. In response to several recent terrorist attacks we have received information Disney at least hired more Orange County Deputies to guard the entrances. After the initial exchanges of gunfire with police, the terrorist was able to kill multiple victims, wound dozens more, and then coral several patrons into a restroom where he successfully kept law enforcement at bay for nearly 3 hours. Many patrons remained hidden inside in other locations, while the police attempted to negotiate a surrender. Sadly, there were wounded among those still inside Pulse, but not necessarily under direct control of the killer. The response of the Orlando Police and Orange County Sheriff’s Department was swift and counter-action was taken immediately – first by the off-duty officer on scene, and shortly thereafter by two on-duty Orlando officers who arrived shortly after the initial exchanges of gunfire. These officers followed the national standard for active shooter training. When the shots began to ring out, they immediately went towards the gunfire, located the suspect and attempted to neutralize him. Unfortunately, the crowded atmosphere inside the Pulse, the darkness of the venue, and the chaos that ensued with panicked patrons, prohibited the initial officers from reaching success and ending the threat. Their efforts are non-the-less heroic, and should be praised by law enforcement and the public alike. An inevitable part of the response to a mass shooting will be rescues of the injured after the threat is contained or neutralized. As the weeks and months progress we hope a full After Action Report is released so all law enforcement officers can understand how this event unfolded, and learn the lessons of actions that worked and those that did not. It will be interesting to see how the law enforcement officers handled patrons fleeing Pulse, and if efforts were made to rescue any of the injured or hidden prior to the final act to neutralize the terrorist. This mass killing went from active shooter (hunt and neutralize), to an armed barricaded hostage taking (hold, negotiate, prepare immediate action plans) in literally a matter of minutes. From what I have read I cannot fault the police commanders from attempting to work the hostage situation to a successful conclusion. 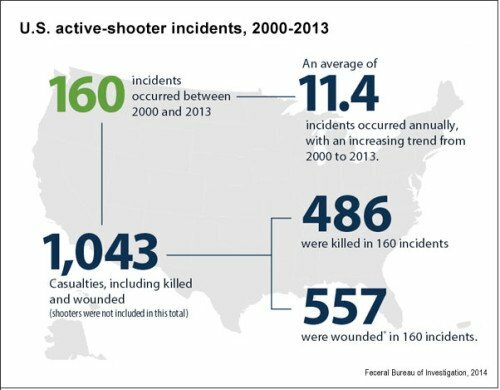 Every active shooter situation can change course (and response direction) with the absence of active shooting, and the known location of the killer. Police officers from Command down to new patrol officer must assess and identify the situation for what it is at that time, not what it was a minute ago, and cannot simply engage a course of action in a “one-size-fits-all” mentality. Things change, and those changes can have dramatic influences on a successful outcome or a horrendously botched effort by police. In this event, had the police screwed up their response, I am confident more lives would have been lost. Initially the officers tried to protect the victims and innocent bystanders by engaging the suspect in a gun battle. However, the suspect was able to retreat into a bathroom with several hostages, and the shooting ceased, or at least became more sporadic and aimed mostly at law enforcement. At that point the situation has dramatically changed. Police officers may be tempted to just burst in blasting and hope for the best, but that is not supported by vetted training organizations like NTOA and IACP. Uniformed patrol officers are the most likely to encounter and end a mass killing (photo by sapdexplorers.com). The standard response at that point is to Contain, Control, and Call-Out. Speed is only part of the equation in effective spree killer responses. By containing and controlling the terrorist’s movements it allows time to plan, evaluate and assess the scene by follow-up officers. Rescue teams can be sent in (if practical) to begin evacuating casualties. Without the immediate stimulus of death to the hostages (shooting, screaming, countdown, etc. ), an attempt by law enforcement to rush the restroom would most likely have ended in catastrophe. The terrorist would have likely placed hostages between him and the police, resulting in an impossible situation for the police to win. The element of surprise would most likely have been lost, even using distractionary devices. Police officers shooting hostages, in the “violence of action” some have been taught for these responses, would have been a disaster likely resulting in multiple police casualties further confusing the chaotic situation. Not that I don’t recognize we are #3 on the list, but sometimes the best course of action for #1 (hostages/victims) and #2 (innocent bystanders) is for us to slow down and hold. If we take the cavalier “John Wayne” approach and those actions bring death or injury to #1 or #2 because of our carelessness, we have failed the Priority of Life just as much as if we sat outside and did nothing during an active killing. Emergency entry for hostage rescue is a last resort effort to save the hostages lives. Flash bangs add smoke, which could hinder efforts. Rushing into the restroom with the circumstances at Pulse would have been playing Russian roulette with the hostages lives, a dangerous game of chance where we are betting we will be quicker and more accurate than the shooter inside his stronghold. It may be necessary if the actions of the killer dictate that course, but otherwise it is just foolish and reckless. Unless something comes out contradictory, I believe the Orlando area law enforcement response was excellent. If a shooter is located, barricaded with hostages it would be unwise to immediately rush in. For that matter, it would be unwise to rush into a stronghold where just the killer is located. Copious amounts of OC and CS gas, along with flash bangs, should severely limit the killer’s ability to resist. Let him come out peacefully to surrender, or come out on your terms into a well fortified line of police firearms. In the Orlando event, once the killer stopped shooting civilians and holed up in the bathroom with hostages, standard hostage incident procedures should be followed. EDITOR’S NOTE: An article posted on PoliceOne.com has agreed with this statement and supported the response by Orlando law enforcement. The lives of the hostages are paramount. Unplanned and uncoordinated assaults on the bathroom would likely cost the lives of hostages. That is unacceptable. Obviously, if the killer begins to kill hostages, and emergency action team should be very close by and ready to act immediately. Any deaths of hostages are on the killer, not on a failed police strategy. However, rushing into the restroom because once the train started moving we couldn’t put on the brakes, is a failure of police strategy and the resulting deaths and injuries are on us. Hostage rescue is the most difficult action a SWAT team will undertake (photo by U.S. Army). It sounds as if the Orlando Police and Orange County Sheriff’s Department responded admirably and extremely professionally. In the 3-hour stand-off a Command Post was established, coordination of resources was delivered, specific assignments were given out, and deliberate and emergency action plans were established. When the terrorist’s actions and words led Command to believe the danger to the hostages was immediate, their well thought-out plans were executed to near perfection. The exterior wall of the restroom was breached with the ram of a Bearcat, while flash bangs (FSDD) and chemical munitions were delivered inside. Nearly simultaneously, the emergency action team entered the restroom and shot the terrorist to death. To date, most in the tactical community have formed opinions of the tragic event in Orlando based primarily on information obtained through open source media and by word of mouth among our peers. As you can imagine, with both an officer involved shooting investigation being conducted by the state and a terrorism investigation by the federal government, there are still many details that cannot be released. The Orlando Police Department (OPD) and all of the supporting agencies conducting the post-incident investigation have been working tirelessly to both move the investigation forward and release information as soon as practical, without jeopardizing these investigations. Recently, a small group of NTOA members, myself included, was provided a briefing on the event from members of the Orlando Police Department SWAT team. What we heard reinforced what most of us in this profession suspected: They had an extremely challenging situation forced upon them, a scenario that started around 2:00 a.m. when an active shooter opened fire in a crowded dimly lit nightclub. The OPD officer working at the club on an extra duty detail began to address the active shooter almost immediately. Even with this courageous response, there were multiple casualties. The responding law enforcement personnel never lost focus and evacuations were occurring as the threat was being contained. This was all happening while the threat of explosive devices and concerns for secondary devices was ever-present and being confirmed through various sources. Orlando SWAT command and operators were always working the problem, and unknown to everyone, they were rescuing those who had hidden and were trapped inside. Around 5:00 a.m. (three hours into a mass casualty event with hostages) Orlando SWAT was informed of a deadline created by the gunman. Due to their assessment, planning and preparation they were ready to deal with this challenge in minutes. Though their efforts encountered setbacks, they had planned for contingencies and acted without delay. Their actions resulted in the rescue of numerous hostages while neutralizing the shooting threat. They never slowed in their efforts, rescuing hostages that had been held by the gunman. During the entire event the focus was on saving lives and the Orlando SWAT team completed its mission with the knowledge that an explosive device may be used against them during their rescue attempt. There is no doubt that the actions of numerous law enforcement first responders and the Orlando SWAT team were selfless and heroic, saving the lives of the wounded and hostages. We know there is still much to be learned about this incident. Just as 9/11 changed security in the United States, this incident will change how SWAT teams focus their response to terrorism in the United States. We should take a step back and avoid judgment until all of the facts are revealed. Ensure every sworn officer has attended a basic Active Shooter Response course. Review your agency and regional active shooter response plans. Review your local mass casualty response plan and discuss with local EMS and hospital personnel. Assess the need to activate neighboring teams early and have them on standby during acts of extreme violence. Ensure your TEMS have a pack ready for multiple victims. 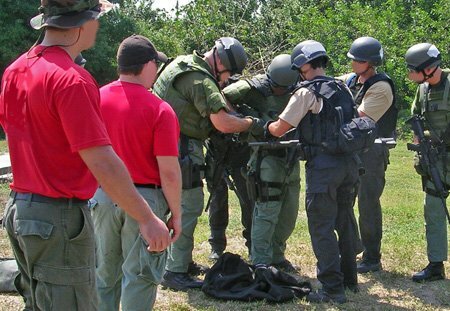 Re-emphasize your team training and equipment regarding hostage rescue. Train with EOD and neighboring teams regularly. The NTOA will continue to work with the Florida SWAT Association and other state tactical associations to support the Orlando Police Department. Undoubtedly, there will be many opportunities in the future for the members of this team to share their story. In the interim, the rest of us should focus our energy on preparing our own teams. 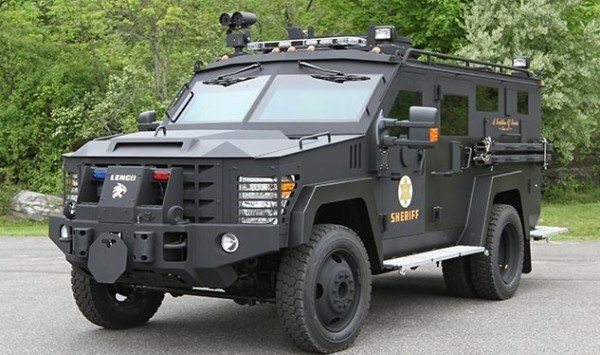 The use of armored vehicles, like this LENCO Bear Cat, increase police options in critical incidents (photo by LENCO). Ultimately the commanders felt an impasse or rise in threat level had been reached. Pre-planned immediate action drills went into effect, with SWAT armored vehicles ramming the outer walls of Pulse and deploying at least two Flash Sound Diversionary Devices (FSDD). Immediately thereafter, SWAT members entered the restroom and killed the terrorist. It is unclear if the murderer had killed any hostages while in the restroom, or what exactly the stimulus was that led to the decision to go in. Regardless, the police performed the actions well, and successfully ended the threat. This allowed emergency medical attention to be delivered to those still inside Pulse, and ultimately fulfilled the law enforcement duty to protect the innocent. Even if the terrorist did not make an overt threat or action to initiate the entry by police, I can support their decision. After three hours, and likely knowing there were still wounded inside, police commanders must begin to question if the terrorist is simply fortifying his position and preparing for an apocalyptic end. Unlike “traditional” barricade situations, or even “traditional” hostage situations, a hostage event after a mass killing cannot be allowed to drag on indefinitely. The recent trend in terrorist attacks has mostly involved the strategy of “lone wolf” attacks. These so-called “lone wolf” attacks involve a single (or sometimes 2-3 accomplices) engaging in an active shooter/spree killing event to advance their terrorist agenda and bring fame to the parent terrorist organization. In addition, the terrorists have likely scouted a target that appeared weak (unarmed civilians) and ideally suited to mass casualties (large gatherings, public locations). Though nature’s wolves typically hunt in packs, the terrorist “lone wolf” inflicts massive damage alone or in small groups, typically staying mobile to kill as many as possible and thwart law enforcement response. In most events the killers have provided detailed social media or other documentation stating their allegiance to a terrorist organization, and/or make terrorist statements as they begin killing. Where nature’s wolf pack can sometimes be scattered and have their attack broken by resistance, the “lone wolf” terrorist appears fully committed to the attack even appearing to invite resistance. This is what makes the “lone wolf” stand out, and why they are so dangerous. 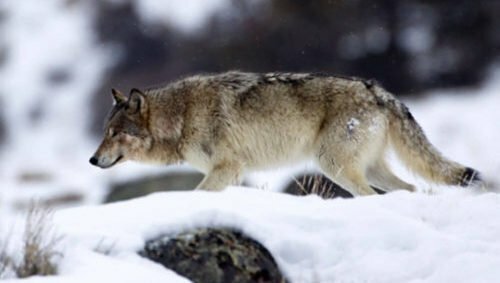 Wolves are typically pack hunters, but the “lone wolf” attacks have similarities in the methods used by nature’s killer (photo from npca.org). The Orlando terrorist attack comes on the heels of the San Bernardino, California terrorist attack. That attack involved two radicalized Muslim terrorists (one male, and one female – very rare in America), who attacked a County employee celebration party and then went into the neighborhoods where they engaged multiple police agencies with rifle and pistol fire. The San Bernardino attack cost 14 victim’s lives, and over 20 injured, including two police officers. The two terrorists remained committed to the very end, exchanging gunfire with police until they were killed. In another “lone wolf” terrorist attack last year an alleged radicalized Muslim terrorist attacked two military offices in Chattanooga, Tennessee. The first act was a drive-by shooting on a military recruiting office before driving across Chattanooga to open fire at the Naval Reserve Center. Four U.S. Marines were killed instantly, another wounded, and a Navy sailor died of wounds two days after the attack. A Chattanooga police officer was wounded in an exchange of gunfire, and the Naval Reserve commander used a personal firearm to shoot at the terrorist. In the end over 100 shots were fired, by a semi-auto AK-47 and a pistol. The attack lasted over 30 minutes, in two locations, separated by several miles and involved the killer using his vehicle to drive to the second location before being killed by responding police. Attackers are prepared to die, but not afraid to engage police in gunfire. The characteristics of a “lone wolf” terrorist attack are slightly different from other spree killings. The main difference is these highly planned events seem to be motivated more by ideology, than a grudge or perceived grievance. 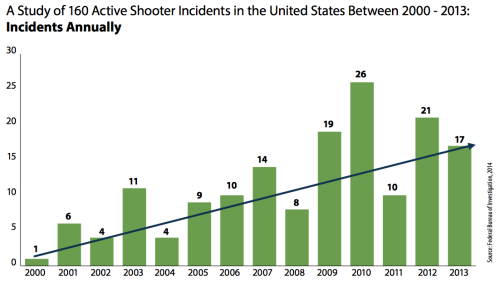 In addition, these “lone wolf” terrorist attacks have seen the killer more likely to engage police in gunfire, where in other spree killings the shooter often kills himself once police arrive and engage him. Finally, unlike most spree killings that stay focused at one target area, the “lone wolf” ultimately hopes to create chaos and casualties over a larger area. This means the killers typically remain mobile – striking and killing and then moving on to other targets of opportunity if they are allowed, where grieved spree killers tend to focus all of their killing at a particular site. 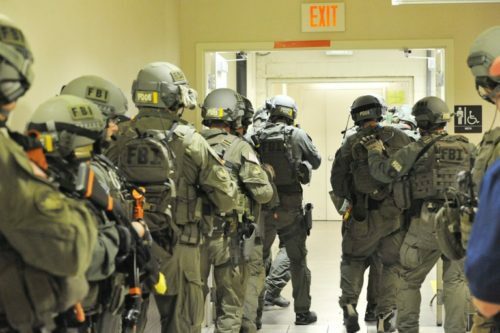 SWAT teams are typically a secondary response to active shooter situations, so Patrol must be properly trained to respond (photo by fostercity.org). At the onset of an active shooter/spree killing police should respond en mass with as many additional resources as possible. Access to armored vehicles should not be kept in the realm of SWAT alone, but should be readily available to patrol as well. Specialized training should be afforded to line officers in patrol rifle, shotgun, active shooter response, team formations, and a highly emphasized Priority of Life understanding. Officers want to respond and help. They want to stop the killer. They want to aid the victims. However, they are often faced with highly complex and rapidly evolving events that tax their understanding of tactics and the appropriate response to the dilemmas they are facing. 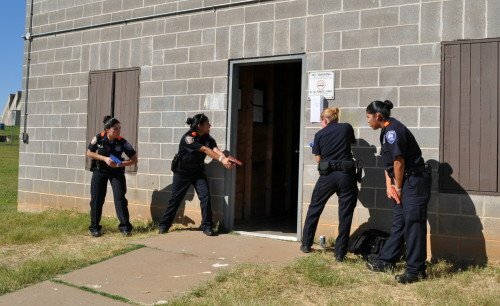 The only way to overcome these stressful and difficult decision-making crisis, is to train the officers on real-life scenarios using force-on-force techniques and adequate training firearms like the UTM kits and munitions we’ve reported on before. Stress inoculation, forced decision-making, and the “penalty” of pain when errors are made can all build understanding and confidence in techniques and tactics necessary to defeat a threat of this nature. So what can civilians do to mitigate the threat of these horrible events? Though the BlueSheepDog Crew are huge supporters of the 2nd Amendment, and civilian carrying of firearms, we also recognize the vast majority of citizens do not and will not carry defensive handguns. There are also many restrictions from private businesses, government buildings, and usually bars. 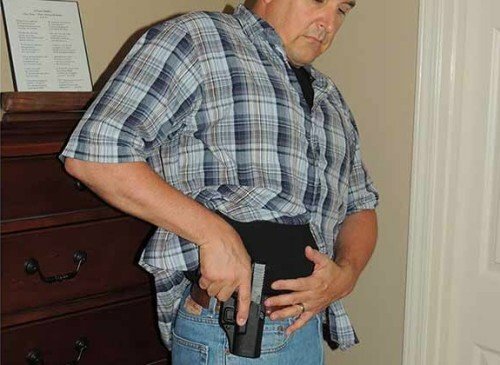 BSD recommends 100% off-duty carry, but we understand pistol size has its limitations. A defensive handgun could have, and I emphasize “could have”, ended this terrible attack much sooner, and there is certainly an argument for allowing persons to carry firearms for defense. However, in a crowded and dimly lit format like Pulse, a potentially minimally trained firearm carrier might have done harm as well as good. There are also good reasons to avoid persons carrying firearms and consuming large amounts of alcohol. This officer had martial arts training, but mistakenly took on a knife wielding assailant. Let’s also be real about martial arts experts, knife masters, and those “pretty good with a bow staff” in critical incidents like this. Don’t be a heroic body count! There are very few opportunities that these close-in, personal fighting skills can actually alter the mass killing in a positive way. Most likely you will simply expose yourself and become the next victim. 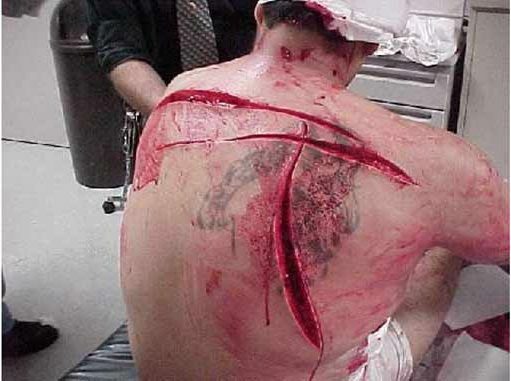 If the attacker is right upon you, and it is the last option available to save your life, absolutely try to punch or stab that thug in the throat! Otherwise, the best course is to eliminate his options for targets by getting the hell out of Dodge! One of the reports from Sandy Hook talked about a 1st grader (likely only 7 years old), hiding in a closet with some friends after the shooting started and the teacher tried to make her class safe. When the killer entered the room and committed atrocities, this 1st grade boy grabbed his friend’s hand, and pulled him out of the classroom as they fled to safety. Most of their classmates, and their teacher, were not so fortunate. Have a plan! Listen to your instincts! Act! Hiding and fortifying your position should only used when escape routes are blocked, or the killer is dangerously close. Hiding and even fortifying a location is no guarantee of safety, as many of the last mass killers have gone “hunting” for targets. All of this leads me into some actually good training by your Federal Government, on how “unarmed, civilians” can and should react in the face of the unthinkable. This still shot from the U.S. 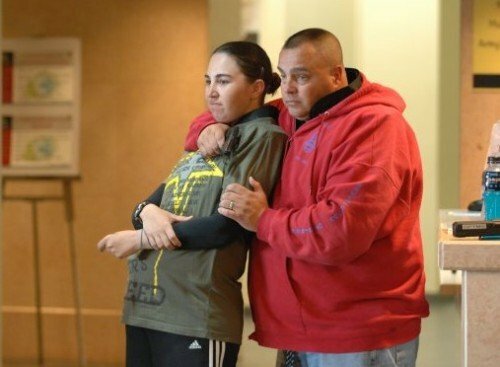 Homeland Security Active Shooter training shows the final step – FIGHT. The United States Department of Homeland Security has come under a lot of scrutiny and ridicule, largely for TSA errors and abuses, a seemingly bloated budget with huge expenditures, and other reported excesses as well. However, their training video on how civilians can respond to an active shooter/spree killer is actually right on. I would highly recommend law enforcement agencies work to educate local businesses, particularly high volume venues, on ways to mitigate casualties. Some businesses have restrictions on having a firearm within the business, and in some States that restriction can even extend into the parking lot (making bringing a firearm to work a recipe for unemployment). With this understanding in mind, civilian workers need to be trained on how to react if evil visits their workplace. Not having a plan has been proven time and time again to cause more casualties, where those who have reacted immediately upon hearing/seeing shots have had much higher survival rates. The Orlando attack is no different! Here’s another thought – how many officers have trained their families on techniques to provide them the greatest survival opportunities in the event they are caught in the killing fields? Sometimes officers train themselves so much to be ready and to respond they forget about the loved ones at home. Danger does not discriminate, and our families can be caught in the crosshairs just as anyone else can. Training them in survival techniques will make them safer in mass killings, all the way to avoiding dark areas and suspicious people. My wife and sons have seen me look at someone with “the look” so often, they are now frequently calling out suspects before I can say a word, “oh yeah dad, that guy is a problem”. I do need to re-emphasize how to get out of the killing zone in a mass killing event like the one in Orlando, San Bernardino, or other places. There is a lot to learn from the attack in Orlando, both for law enforcement and the civilians who may find themselves confronted with the face of horror. First, civilians should learn they must be vigilant about their surroundings at all times. Civilians should recognize the need to train themselves to look for suspicious behavior, and plan an out. Know where the exits are, and avoid situations that will cause you to be caught up in the stampeding crowd. 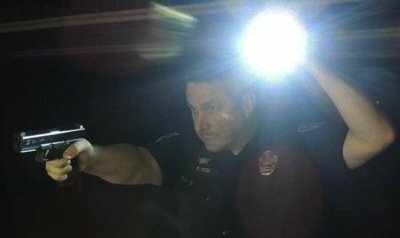 Proper flashlight use by patrol officers is critical for success. Police patrol officers absolutely must understand they are the tip of the spear in the response to these devastating tragedies. With that knowledge officers should frequently quiz themselves with “if this happened/then what would I do”. Simple mental training like this provides ample resources for the unconscious mind to recall in a critical incident. More resources means faster and more deliberate response. Patrol officers should familiarize themselves with team movements, standard T-Y formations for active shooter response, lethal force guidelines in these situations, and awareness of additional tools (Bearcat, battering ram, sledge-hammer, pry bar, etc.) available to patrol officers. Having a solid grasp with flashlight use and your firearms is also a must, as well as taking a long gun whenever possible. Getting into full kit is time-consuming under the best circumstances. Be ready to go with less. SWAT Teams should have Go-Bags readily available – in their patrol cars, and even their personal vehicles. When an event like this kicks off there is no time to drive to the station to get dressed out, and then respond to the scene. 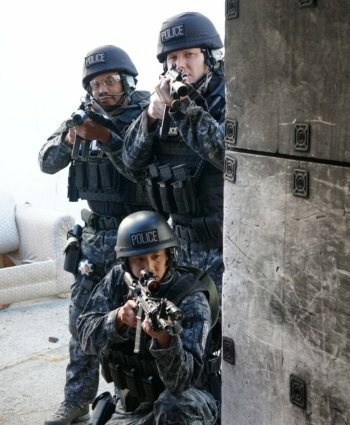 SWAT operators need to be able to respond immediately after the call-out, as much as possible. Once on scene SWAT officers may be called upon to take over primary response duties, and this in an impromptu combination of Patrol and SWAT officers. Direction and guidance should be helpful and not demeaning. Recognition of what the situation really has become is crucial as well. In Orlando, the barricaded hostage situation was recognized and the police response changed to meet the new challenge. SWAT officers will most likely take over primary roles in the resolution of a hostage/barricade situation. Staying up to date with the use of flash bangs, chemical munitions, armored vehicles, and high intensity rescue operations are a must. However, in many cases they will likely be responsible for secondary searches and rescue operations. Team members should be ready for this with emergency medical supplies like a tourniquet. 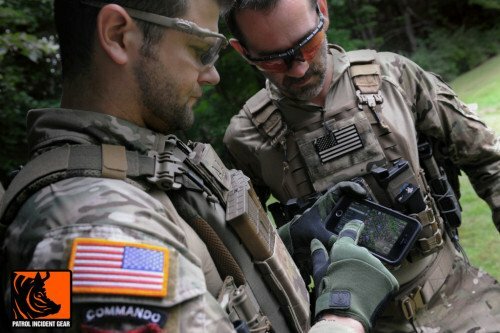 The use of smart phones and other touch screen technology can be highly beneficial, but command ultimately comes down to decision-making. Commanders have a duty to lead the officers in a meaningful, and well thought-out action plan. This requires a great deal of familiarity with complex, multi-agency operations. The dreaded Incident Command System (ICS) will no doubt be instituted, but though its processes are laborious they are vetted to allow the most systematic and efficient response to critical incidents of this magnitude and nature. Commanders must also, even more critically, be 100% familiar and comfortable with their department’s policies and procedures for active shooters/mass killers, hostage situations, and barricades. Understanding the SWAT lingo is paramount even for commanders who may not have prior SWAT experience, but more than lingo all Commanders must understand the capabilities and limitations of their SWAT resources. Calling in for a helicopter insertion when you don’t even have a helicopter wastes time and erodes confidence in command. In the Orlando incident, when the terrorist’s actions and words reached the level determined to be an immediate threat to the hostages the police commanders did not hesitate or squabble about authority, action plans, or responsibility. The commanders acted. Using a Bearcat to ram holes in a building, discharge chemical munitions and flash bangs (even on the hostages) is not an easy call, unless the commanders are fluent in law, policy, resources, and proper tactical applications. Bravo here, commanders! Finally, the commanders did not bog down at the critical moment, or try to continue in the relative safety of a response to a barricaded subject. They recognized the threat and acted. This same confidence must be delivered by every officer on scene. Had the commanders, SWAT teams, patrol officers or negotiators failed to recognize what was before them, the outcome could have been as horrific as Beslan – where the terrorists had plenty of time to heavily barricade themselves inside severely hindering the brave efforts at rescue there. The terrible tragedy in Orlando reminds us we must be vigilant, and the lessons learned may make us more capable of stopping these terrorists before they can act, or more quickly once they have begun their evil deeds. EDITOR’S NOTE: If there are any readers who have had experience with an active shooter, or God forbid a mass killing, please respond in the comments about the things done right and the lessons learned. The benefit of learning from first hand accounts is immeasurable to other law enforcement officers. Also, if you have verifiable information that can enhance or clarify this article please post a comment as well. Thanks for the note, and you are right – it was an unfortunate one. It has been corrected.